The PKB4211D and PKB4110D isolated, eighth-brick DC/DC converters are claimed to have world-leading efficiency of 95% in eighth-brick format 40A class of power modules. They are also claimed to have industry-leading thermal performance at 85°C ambient temperatures at 3.3V out in a 40A class eighth-brick format for airflow-limited environments. Enabling reduced energy and cooling costs, the two modules are the most efficient 40A-class eighth-brick-format power modules in the industry. The PKB4211D and PKB4110D deliver efficiencies of up to 95.3% and 94.7%, respectively, with tightly regulated 5.0 and 3.3V outputs at 50% load. According to the company, competitive products will typically dissipate approximately 8% more power at a full load of 40A when compared to the two converters. The modules target high-end and high-power applications that are powered by multi-cell batteries or rectifiers, commonly used in the information and communication technologies (ICT) industry. They are designed for distributed power architecture systems, including telecommunications and networking, servers and storage systems, and industrial equipment. 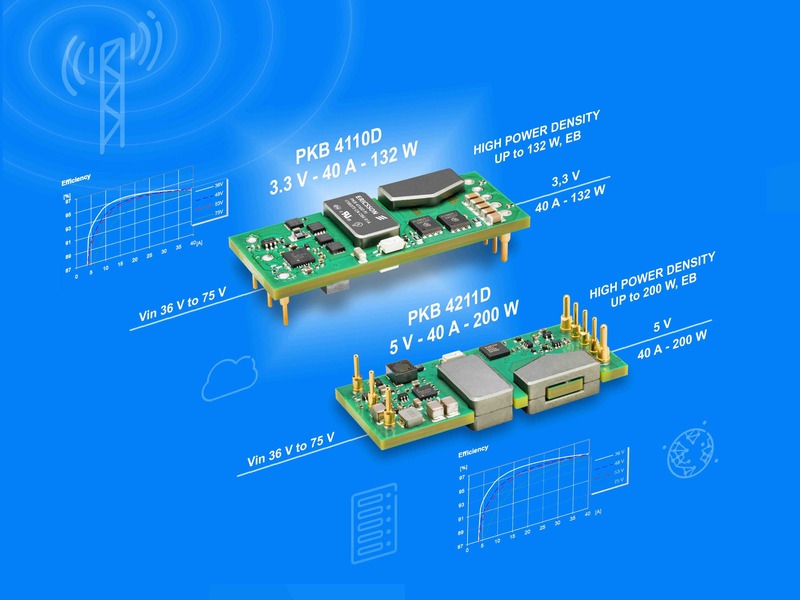 Offering an input range from 36 to 75V, the PKB4211D delivers up to 200W output power with a 5.0V, 40A output, and the PKB4110D provides up to 132W with a 3.3V, 40A output. Both are available in an industry-standard DOSA-compatible, five-pin, eighth-brick footprint. Dimensions are 58.4 x 22.7mm and a low-profile height of 9.6mm. The converters deliver higher usable power in high ambient temperatures and environments with limited airflow, says the company. The PKB4211D can deliver full power of 5.0V at 40A in an ambient temperature of 70°C with 200 LFM (linear feet per minute) airflow in an open-frame unit with no baseplate. The module can also deliver the same load in an ambient temperature of 80°C with 200 LFM airflow with optional heatsink. The open-frame version of the PKB4110D delivers a 3.3V 40A output at 80°C with 200 LFM airflow and at 85°C with 200 LFM airflow with a baseplate. The optional baseplate offers improved thermal performance, say the company, although the units can also be connected to a heatsink or cold plate. Offering a mean time before failure of 9.33 million hours, the modules meet safety requirements according to IEC/EN/UL 60950-1 and offer I/O isolation of 2250V DC. Protection includes output-over-voltage, input-under-voltage shutdown, over-temperature, output short-circuit, monotonic start-up and remote control capability. The two modules are available in through-hole and surface-mount versions and are available now in production volumes.